Congratulations to "Brooke B", the winner in Alison's giveaway. Thank you to all who participated! Do you remember a world before CNN? When you actually had to wait until 6 pm to watch the news? When was the last time you picked up a newspaper and were surprised by the headlines? I still remember the sinking feeling in my gut the next morning when I read the bold headline in The Philadelphia Inquirer: “Diana Dead”, or something along those lines. How could it be? Dead? TV news and newspapers co-existed for many years in my household. But, it was the Internet that finally forced my hand. I cancelled my subscription to The Buffalo News when I realized there was nothing in the paper that I hadn’t already read online. The defining moment was when I grabbed the newspaper out of the box and the news was actually old. The front-page headline was outdated. Now, strangely enough, I find most of my news comes through social media. I remember the friend who first posted her shock at the events in Newtown. And if a friend doesn’t “share” a news story, I see it first-hand through one of the various news outlets I follow, ironically including The Buffalo News. This constant access to news has caused a problem for me. Unless I completely unplug, I can’t escape it: the good, the bad and the horrible. Some days, I don’t want to know about the mall shooting or the hit and run, but I still want to connect with my friends. However, it’s all in one big mash up on Facebook: cute kitties next to terrorist attacks. For someone who writes and reads romantic suspense, I know it sounds strange, but sometimes the tragic events in real life are too hard to see. I think that’s why fiction is so appealing. The bad guy always gets his/her comeuppance. What do you do when you want to escape the news? Are you disciplined enough to shut off your tablet, phone or your laptop? Or are you a news junkie regardless? If you’re looking for a book about a people who really know how to stay separate from the outside world, check out my February release, Plain Peril (Harlequin Love Inspired Suspense). It’s my second Amish book set in the fictional town of Apple Creek, NY. 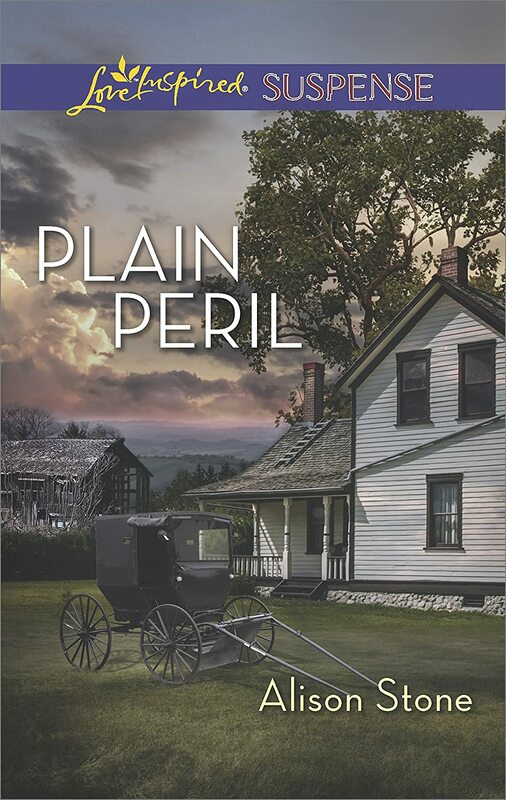 I’ll be giving one random commenter an e-book copy (Amazon/US or Barnes and Noble/US) of Plain Peril. She can be found at www.AlisonStone.com and Facebook https://www.facebook.com/AlisonStoneAuthor and Twitter https://twitter.com/Alison_Stone. Giveaway ends 11:59pm EST February 3rd. Please supply your email in the post. You may use spaces or full text for security. (ex. jsmith at gmail dot com) If you do not wish to supply your email, or have trouble posting, please email maureen@justromanticsuspense.com with a subject title of JRS GIVEAWAY to be entered in the current giveaway. This sounds like a really good book! I love reading about the Amish, and their culture and beliefs. Now I can't help but wonder what happened to bring murder into their normally peaceful society. I am not one that likes seeing the news everyday... If I am interested I turn on the cable news channels. I prefer the intrigue and HEAs of books to spend my time on. Thanks for sharing today! All the bad news can be draining. Thanks for stopping by, Colleen. Love your books. Read Love Inspired Suspense books all the time. Yay, Mary Ellen! I love Love Inspired Suspense, too. Thanks for stopping by. I am definitely not a news junkie - I don't turn it on unless I have to, like if I know something major is going on. I focus my attention on something else usually, like reading. This sounds like a great read - Love Inspired Suspense is such a great line! My home page is actually a newspaper. The headlines change constantly throughout the day. I don't read a paper newspaper or watch it on TV. What a fun idea, Mary. Thanks for stopping by. I used to read newspapers cover to cover now that I'm online newspapers seem dated. Rhonda, that's exactly what made me cancel my newspaper subscription. It seemed dated! Sad. :( Thanks for stopping by. I find the news so disturbing that I can't watch it while I eat. In any case, it is easier to hear about it than to watch it.